His initial musical experiences were as a trumpeter with the brass band at the school where his parents taught. Trumpet playing is still an important part of his life although for much of his professional life he has devoted himself to developing a new and personal language with the piano. Following education at Surrey University where he studied composition with Reginald Smith Brindle, Sebastian Forbes and Robin Maconie, Chis Burn became involved in free improvisation. A commitment to this way of working has stayed with him throughout his career. He considers all his compositional work to be informed by his experiences in this area of contemporary music making. In 1984 he formed Ensemble, an octet of improvising musicians whose work embraces some aspects of composition. This group is still working today and has performed at many European festivals and broadcast on radio and television. On leaving University he made his living as a pianist, conductor, arranger (particularly dance band scores) composer for dance and teacher. At this time he developed what was to be a life long interest in extending the sound world and performance techniques of the piano. This lead to a complementary interest in Cage, and particularly Cowell. Although many of his early works were for large orchestral forces, (including 3 evocations, premiered at St Johns, Smith Square,) the last decade has seen a concentration on small ensembles and pieces for solo piano. 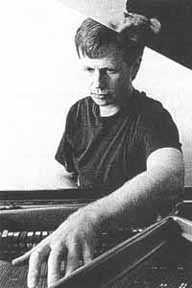 VICTO have released a collection of solo piano pieces recorded at the 1996 Victoriaville festival, Canada. Other festivals where he has performed his material include Ulrichsberg Kalaidaphon, FMP Berlin, LMC London, Bochum Germany etc. Many of his ensemble pieces have worked with notated material used in conjunction with freely improvised material. For his work in composition he was shortlisted for a Paul Hamlyn award in 1993. He has received many other grants and prizes for his work. He currently continues to give lectures and concerts of Cowell, does a small amount of teaching, performs in many situations as a free improviser, is preparing a new CD of Ensemble pieces and continues to play 5 a side football. they will play this piece at Bangor Festival of new music on 9th April 2003. Philip Thomas has given a number of performances of "Only the Snow..." and "As if as". new piece for tpt and snare drum with Duo Contour (www.duocontour.com). Chris Burn's Ensemble have released the CD Navigations to worldwide critical praise. Chris Burns scores are all available from the composer. The CDs are available from ACTA Records. To contact Chris please e-mail Email.